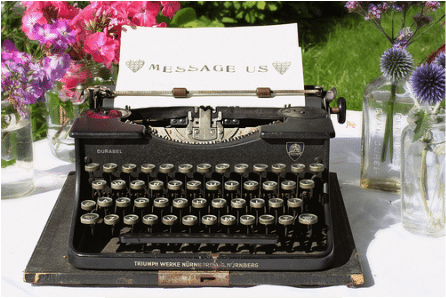 There are some fun and unique ways for guests to leave their messages at the modern day wedding and we are so spoilt for choice it's sometimes hard to decide. 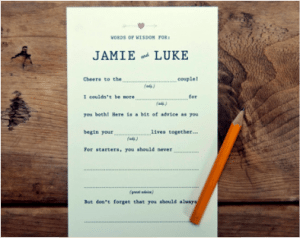 This blog outlines the best guest book ideas we've come across in our travels...Did you know we hand-make personlised guest books? 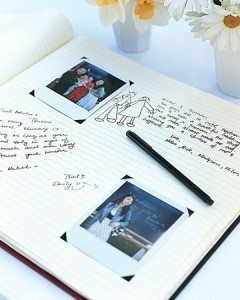 The latest trend in guest books- the guest lib. Your guests won't have to fiddle with their thumbs thinking of what to write with these neat cards, just fill in the blanks. So very neat! 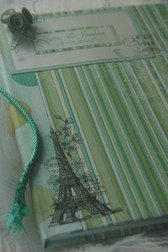 Like it. I LOVE this idea! 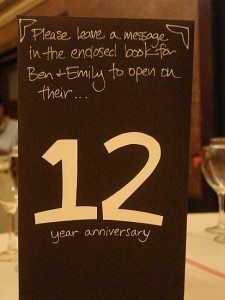 Each table number is on a small guest book and every person on that table can write a message or piece of advice for the couple to open on that anniversary. Wouldn't that be exciting! Don't think I could wait. 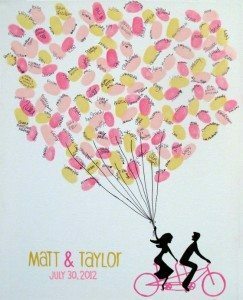 The fingerprint tree, balloon or peacock... These are so cute and a great piece of art for your home for years to come. You can either instruct the guests to leave their fingerprint with or without their names. The note tree. 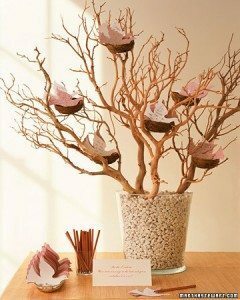 Guests can write their message on a card or dove in this case and hang on your wedding tree. Leave us a note! 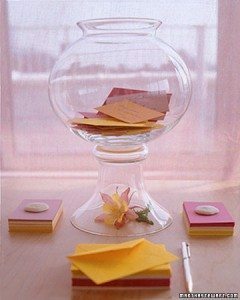 Sometimes it's hard for the guest book to get around the whole wedding, why not put a pen and a few notes on each table and the guests can drop their cards into a decorative bowl. Marriage Solutions. This album has been filled with small envelopes. 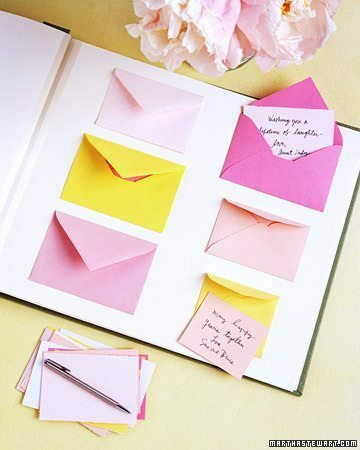 I would put titles on the envelopes like; "When were fighting...," "When he's late home from work...," "When it's that time of the month..."
This is such a sweet idea. 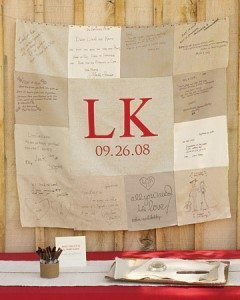 Each guest writes their message on a piece of square fabric which is then sewn into a quilt for the couple. 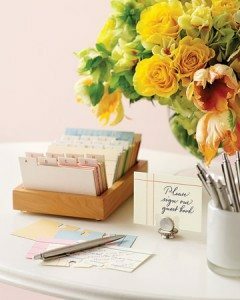 This guest book poses a question for your guests to answer. Phew, it's so hard to think of what to write! The good ol typewriter. A fun way for your guests to leave their message and it adds a vintage charm to the reception decor too! But how to present it afterwards?